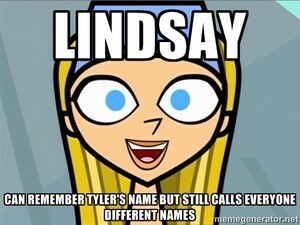 Lindsay Meme. Lindsay fans, please don't start a lynch mob with pitchforks and torches. I simply created this image because well, isn't it a true fact she can't remember the names of the other characters?. 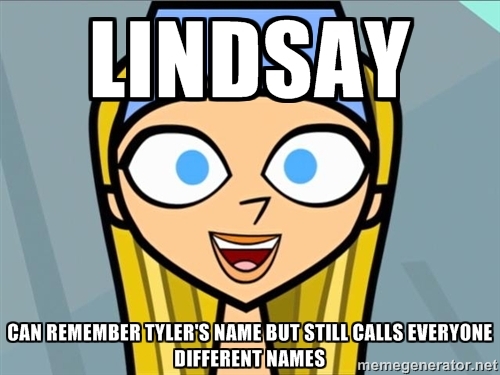 Wallpaper and background images in the Total Drama Island club tagged: photo meme lindsay. She knows Tyler's name because she loves him. Notice how she remembered Heather's name until she betrayed her, Lindsay calling her "Hannah" in TDDDDI.